Henshaw, George, age 26, born in Wales; parents foreign-born; shoe maker; $600 personal property. Henshaw, Ann, age 31, born in Wales; parents foreign-born; keeping house. Henshaw, Thomas, age 4, born in Wales; parents foreign-born. Henshaw, George, age 2, born in Wales; parents foreign-born. Henshaw, Benjamin, age 1 month, born May  in Ohio; parents foreign-born. This is to certify that the Rev. George Henshaw has been set apart to the work of the Gospel Ministry by the Word of God and prayer. Henshaw, George, age 35, born in England; parents born in England; shoemaker; sick or disabled: typhoid. Henshaw, Ann, wife, age 40, born in Wales; parents born in Wales; keeping house. Henshaw, Thomas, son, age 13, born in Wales; father born in England; mother born in Wales; attended school. Henshaw, George, son, age 12, born in Wales; father born in England; mother born in Wales; attended school. Henshaw, Maria, daughter, age 8, born in Wales; father born in England; mother born in Wales. Henshaw, John, son, age 6, born in Ohio; father born in England; mother born in Wales. Henshaw, Ellinor, daughter, age 4, born in Ohio; father born in England; mother born in Wales. Henshaw, Mary Jane, daughter, age 1, born in Ohio; father born in England; mother born in Wales. Henshaw, Lewis, son, age 2 months, born Mar  in Ohio; father born in England; mother born in Wales. Henshaw, George, head-of-household, age 55, born June 1844 in England; parents born in England; immigrated 1868, U.S. resident 32 years, naturalized; married 36 years; occupation: preacher; rented home. Henshaw, Ann, wife, age 60, born Aug 1839 in Wales; parents born in Wales; immigrated 1869, U.S. resident 31 years; married 36 years; 9 children, 8 living. Henshaw, Anna, daughter, age 16, born Dec 1883 in Ohio; father born in England; mother born in Wales; attended school. Henshaw, George, head-of-household, age 65, born in England; parents born in England; immigrated 1868, naturalized; widower; occupation: minister, rural parish; rented home. Henshaw, Anna, daughter, age 25, born in Ohio; father born in England; mother born in Wales; single. This person's ancestry is unknown! 1880 census, 4th Ward, Pomeroy, Meigs County, Ohio; roll T9-1047, ED 111, page 143A, line #29, dwelling #8, family #8. Ohio, County Marriages, 1790-1950; LDS Family History Library: http://www.familysearch.org. Ohio, Births and Christenings Index, 1800-1962; http://www.ancestry.com. 1900 census, Andover, Ashtabula County, Ohio; roll T623-1237, ED 1, page 15B, line #82, dwelling #389, family #390. Contribution from Timothy Parrott (). 1870 census, 4th Ward, Pomeroy, Meigs County, Ohio; roll M593-1242, page 202A, line #25, dwelling #149, family #156. 1910 census, Huntsburg, Geauga County, Ohio; roll T624-1185, ED 60, page 3B, line #75, dwelling #53, family #53. "The Newark Advocate", Nov 11 1915; http://www.ancestry.com. 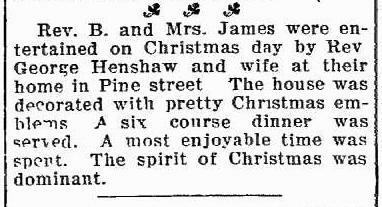 "The Newark Advocate", Dec 27 1915; http://www.ancestry.com. "The Newark Advocate", Jun 14 1913; http://www.ancestry.com. "The Newark Advocate", Oct 4 1913; http://www.ancestry.com. If you have additional information on this person, please share! You can download the information on this page to a file on your computer. Several options are available - see the available file types below. Click on one of the links shown below to choose the type of file desired. When your browser asks if you want to save the file, tell it to "Save As", and then, using your browser's "Save As" dialog, find the folder on your computer where you want it saved, and type-in a file name for the file to be saved. With some browsers you might need to "View Downloads" and then save the downloaded file from there. Open the file with your word processing program, or your genealogy program, and edit the file as desired. Please retain the copyright notice within the file! The purpose of the copyright notice is to prevent a company (or a person) from harvesting this data and then re-selling it (as a book or whatever). We don't want our descendents (or cousins) to have to pay for this information, which was collected with the intent to make it freely available. You can save a copy of this person's page in HTML format, which you could then edit as you wish using many common word processing programs such as Microsoft Word or Open Office Writer (if you need a word processing program then Open Office is great, free and recommended). Note: once in your word processing program then you should have options to save the file in an alternate format, e.g. as a ".doc" file, or perhaps a ".pdf" file, etc., depending on options available in your word processing program. Click here to download the file in HTML format. You can save a copy of this person's page in simple text format, which you could then edit as you wish using many common word processing programs. You won't see the same appearance as the web page, but you'll have all the text which you can edit any way that you wish. Click here to download the file in Plain Text format.